In 2008, Projekt released Nada Terma in a Jewel Box. This is the 2011 Digipak reissue. 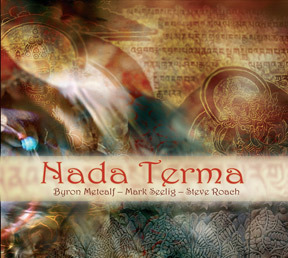 Following upon the groundbreaking work of 2006’s Mantram, Nada Terma is the second Projekt collaboration between Arizona’s Steve Roach and Byron Metcalf with Germany’s Mark Seelig. On Nada Terma they reach deeper into the mystical / spiritual realm, presenting a blend of diverse worlds skillfully combined in an organic fashion. Deep-trance frame drums, clay pots and percussion meet with harmonic overtone vocals (akin to Tuvan throat singers) and the yearning sounds of the stringed Indian Dilruba, and East Indian bansuri flute, bringing a melodic and spiritual-contemplative highlight to the release. All of this exists within an enigmatic world of shadow and shifting light developed by way of artful enhancements and processing of the acoustic instruments. These complements are part of a constant, slowly breathing subtext of drones and atmospheres in which the entire experience lives.